The other day my daughter teased, “Hey Mom, now all of us will go out of the house in the morning, me and brother to school and dad to the office. You will be alone in the house.” While I muttered under my breath “You have no clue how desperately I have been waiting for this” Yup! With two kids your house is never quiet, especially as long as both are not in formal school. My younger one will start preschool this year and I have been so waiting for it. He in school will mean two hours of peace at home, well not exactly because I will be motoring through to finish chores and blog posts before he is back, but still it is better than not getting done anything in the whole day. If you are a mother of two, you know there is no peace or ‘me time’ anywhere in the house, except the bathroom. The bathroom is my hiding place when things are getting out of hand and I need a breather. When the going is good, I can actually think, maybe even read a book (at least a few pages) and check on my social media while in the bathroom. And then there are times when the moment I enter the bathroom one of them want something from the bathroom or have some questions that just can’t wait till I come out of the bathroom. Another place is my car! I leave to pick the kids and take the longest possible route to have some ‘me time’ with music on. This helps me think, focus and even relax before the next rush hour starts. As it is with two kids, you are always running errands for one or the other, the best way to utilize that time is unwinding. Do you have such unwinding places? What are those? I would love to be inspired. 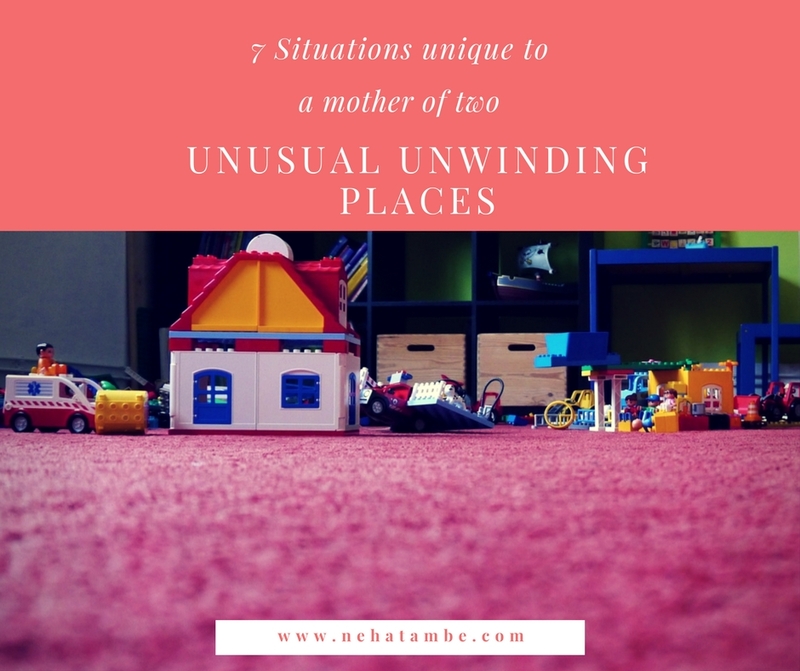 I am writing this post for #Barathon from Blogarhythm with the theme seven situations unique to a mother of two. Oh tell me about it! The bathroom is such a haven. Even though, my kids now 10, are at the door within minutes of me going in asking for something or the other, but still, I can stay on there at least for a while and postpone the chore. I completely empathise with you. I so relate to your relief on the younger starting his school. My younger one is only currently. I am desperately waiting for him to join school next year so that I could have some peace and time to myself. I don’t know if your blog is meant for mothers as a core theme, but this post of yours is something that I have enjoyed reading. He he he bathroom was my mom’s me-time place too. She would often hide from the three brats that were her kids. Glad that you will be finding more time for yourself now. It is so tough to be a mom. I keep hearing about the lack of ‘me time’. Hahaaa! Balcony as a place to unwind is believable. But Bathroom & Car- seriously unlikely – but glad u hav find them relaxing. It works for u – n that is more important. Loved reading your post! Very unique indeed. Haha! When does it end Shilpa, I really want to know. Thanks for stopping by!